Climate Change And Shifts In The Migration Patterns Of Birds : 13.7: Cosmos And Culture Anthropologist Barbara J. King explores links between global warming and migratory bird behavior as new research on white storks reveals some are wintering closer to home. Just in time for World Migratory Bird Day, May 10, an article in the April issue of Animal Behaviour explores the impact of shifting migration patterns in one population of migratory birds. An international team of biologists and ecologists used GPS and body-acceleration data on juvenile white storks to report on shifts in the birds' migratory behaviors. They concluded that "wintering in Europe instead of Africa enhances juvenile survival in a long-distance migrant," which is also the title of their paper. "In many Holarctic bird species, migration phenology is adjusting towards an earlier arrival to breeding grounds to accommodate the earlier onset of spring [brought about by global warming]. In addition, an increasing number of studies have also reported that Holarctic migrants are shortening their migration and overwinter at higher latitudes closer to their breeding grounds." Their study birds, 54 white storks from a population located in Germany, illustrates this in-progress shift in overwintering. Traditionally, these birds use a flyway corridor to migrate to Africa — but now a minority of them migrate within Europe, a much shorter distance. Rotics not only compared the survival rates of six Europe-overwintering and 48 Africa-overwintering juvenile white storks, they also fitted the birds with small solar-charged GPS transmitters to monitor specifics of their movement patterns. Of the six Europe-overwintering birds, 100 percent survived through their first year, versus only 38 percent of the Africa-overwintering ones. It's hard to pinpoint precisely why that survival difference occurred, but thanks to the GPS data, a key probable factor — in addition to the obvious one of the reduced flight distance involved — can be suggested. At the Europe overwintering grounds, the birds displayed reduced movement, and used smaller foraging habitats. They foraged more at anthropogenic sites such as rubbish dumps and agricultural areas, which apparently takes less energy than hunting for prey in the wild. That probably helped all of them to make it, instead of only a fraction. "Our findings relate to the first-year period, although, in the long run, overwintering in Europe might not necessarily be the optimal option, possibly due to long-term detrimental effects of feeding on waste or erratic effects of severe winters. Furthermore, survival benefits of overwintering in Europe may be restricted to juveniles and might even be reversed at older ages, as has been found in other birds." 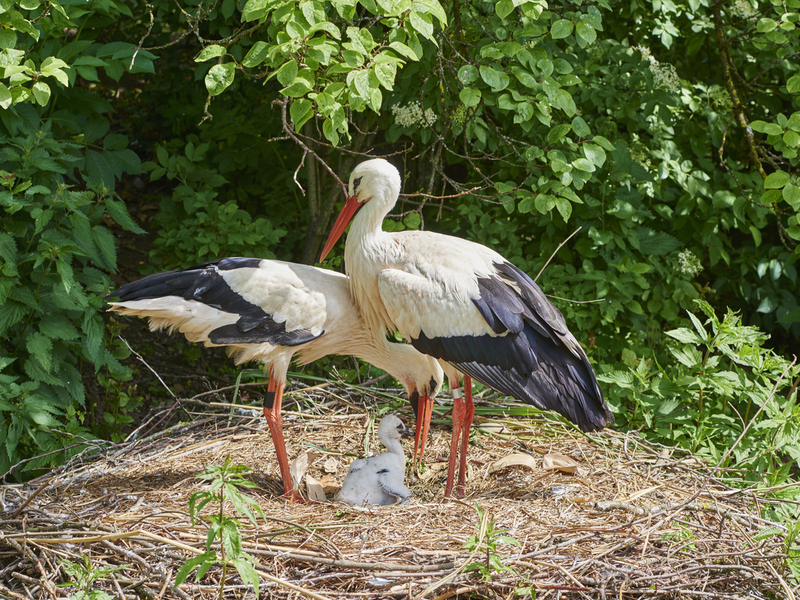 They go on to note that a European Union directive to reduce open landfill areas is likely to significantly decrease the suitability of European wintering grounds for migratory birds, including white storks. It would be entirely wrong to jump from a study showing good survival in a small sample of white storks to a conclusion that anthropogenic global warming isn't so bad after all for migratory birds because they are reducing their flight distance and thriving closer to home. As Rotics et al. explain, we know neither the long-term effects of Europe overwintering on bird survival nor whether the suitability of those European landscapes for migratory birds will be sustained. Even more importantly, the overall threats of global warming to birds generally are quite clear. The 2014 Audubon Climate report's headline is pithy and pointed: "314 Species on the Brink: Shrinking and shifting ranges could imperil nearly half of U.S. birds within this century." The reported details lay out the causes for this peril. And that's just one analysis, for one geographic region. Migratory birds, so fascinating in their nomadic behavior as science writer Carl Zimmer described earlier this year in The New York Times, increasingly face a whole variety of new risks because of the ways we humans alter the landscape. More science will help us understand what is happening to migratory birds and how they are — and aren't — able to cope.